Well, there was a change of plan for dinner tonight. Normally Mondays mean leftovers for him, and I have a muffin-tin…. but tonight, just 30 minutes before he was due home, I discovered that he did not have a lot of his lamb curry left in the fridge. Never fear, for the easiest curry in the world came in to save the day. On a quick side note, it may be worth mentioning that he is an Indian meat-lover, and I am a Kiwi vegetarian…. which often makes mealtimes interesting. If I am putting on a full Indian meal, with a number of curries, this is always one on the menu. Though it is not the prettiest dahl in the world, it is tasty, quick and cheap. Usually I make it hotter, but tonight I worked it to be more lunch-friendly. Curry is always SOOOOO much better the next day. The cooking process is simple. In a fairly large saucepan, heat the oil. Dice your onion while this is heating, and throw it in the pot. Crush and chop your garlic, throw that in as well. Stir. Make sure your saucepan is over a REALLY low heat, or things will burn to the bottom…. Add the 2 bay leaves, stir. Measure and throw in the spices in order as above, stirring between each one. When the onion is clear (or yellowy-clear from the turmeric), add 1 cup of water. Add a cup of red lentils. They do not need to be rinsed first, but other sorts will need the rinsing. Add the second cup of water. Crush the stock cubes into the pot. You can use liquid stock (2 cups) instead, but I tend to have stock cubes on hand. Keep stirring occasionally, making sure the lentils don’t stick to the bottom. The whole thing should be cooked in 20 minutes. When the lentils are soft, remove the bay leaves, and add the chopped coriander. As a main, this will serve 4. I tend to use half for dinner for 2, putting the rest in the fridge for lunch on the next day. He likes to take it to work with rice. I like to have mine as a toasted sandwich filling…. When making a full Indian meal, I tend to use this along with a lamb curry, and a chicken curry, with sides of Bombay potatoes, a really lovely cucumber dish, and a selection of breads (naan and roti). 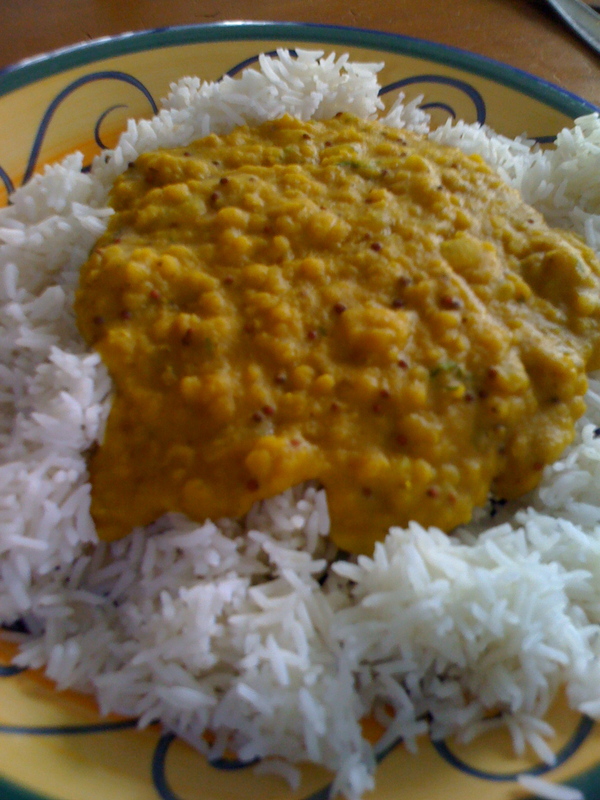 January 10, 2011 in curry, dahl, lentils, recipes, rice.